In a conference room across the hall from his still-undecorated State Capitol office suite, Gov. 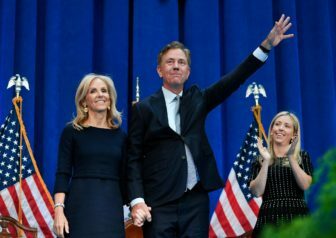 Ned Lamont and his senior staff worked Thursday afternoon on setting the rhythm and cadence of a new administration — and the man who leads it. Wednesday nights will be kept open, time set aside for the new governor to network with legislators and others at the Executive Residence in Hartford, beginning next week. He hopes to split his weekends, some in Greenwich and others in Hartford. His scheduler took note. He is early to bed and early to rise. A surprise, perhaps, to anyone treated Thursday to a video of his dancing the previous night to the Wild Cherry classic, “Play That Funky Music.” It was posted on Twitter by his legislative director, Chris Soto. 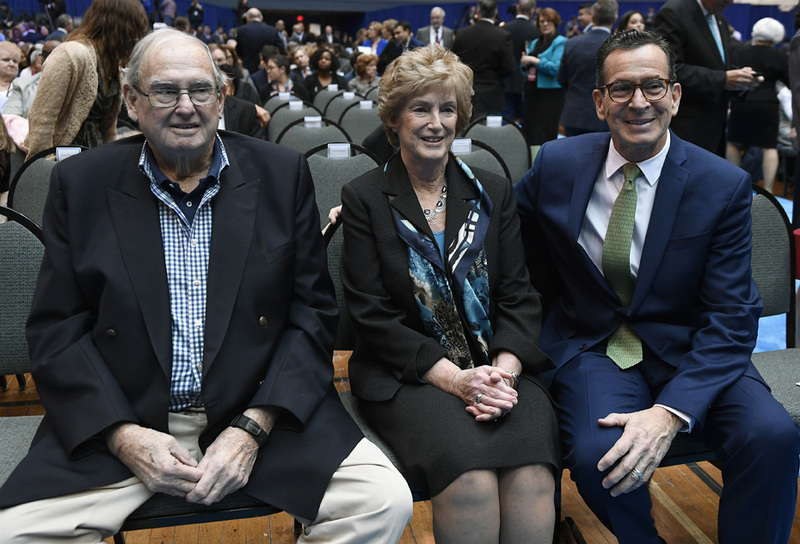 At 65 years-old and after more than three decades of marriage, Lamont is intent on spending as much time as possible with his wife, Annie, a venture capitalist with a firm in Greenwich. The couple expect to divide their time between Hartford and Greenwich. Again, the scheduler took note. And so it went on the first full day of the Lamont administration. It began with a brunch at the Residence with his wife, their three children and the out-of-town relatives and friends who attended his Inaugural Ball. The senior staff gathered at 2 p.m. with the governor. They reviewed potential legislation, the likely schedule for rolling out a budget, the mechanics of a governor splitting time between two homes, and his preferences for how to work. “The governor-elect, uh, the governor likes the creative white space,” Drajewicz said. Creative white space is brainstorming and time for Lamont to pose questions. Drajewicz smiled at his own reference to Lamont as the governor-elect, one of many adjustments being made Thursday. Lamont’s senior adviser, Colleen Flanagan Johnson, and his chief operating officer, Paul Mounds, will share an office directly across the hall from the governor’s suite. On Thursday, there was no desk for Mounds. A worn conference table was pushed towards the door, bound for destinations unknown. But the phones worked. Lamont’s staff says the administration of his predecessor, Dannel P. Malloy, prepared a comprehensive transition plan. Mounds updated the governor and staff on the status of hiring new commissioners. Of the 28 state agencies, Lamont has hired eight new department heads and retained 10 from the Malloy administration. There are ten others whose leadership is undecided. In his initial speech to the legislature, Lamont emphasized economic development as the key to Connecticut’s fiscal ills. He promised three things: Growth! Growth! Growth! Lamont’s staff has been working on an overhaul of the Department of Economic and Community Development, and the governor hopes to outline the new approach and introduce the person who will lead it in the next week or two, Drajewicz said. The goal is to standardize the approach taken by the state last year, with Lamont’s involvement as a volunteer, that convinced Infosys to open a technology hub in downtown Hartford. Business and academic leaders were enlisted in the recruitment. One of Lamont’s friends, Indra Nooyi, the former chief executive of PepsiCo, introduced him to a top executive of Infosys. During his State of the State speech on Wednesday, Nooyi sat on a bench in the well of the House with Ray Dalio, the founder of the world’s largest hedge fund, and John Olsen, the former president of the Connecticut AFL-CIO. “If you look at who was sitting there yesterday, these are people who could be anywhere,” Drajewicz said. Lamont is a networker. He has few relationship with legislators, but his approach with them and business leaders will be personal. Hence, the reservation of Wednesday nights for networking. “It’s critically important to him,” Drajewicz said. The question of dividing time between private and public homes was an issue for Lowell P. Weicker Jr., who initially insisted he would stay many nights at Apple Jack Farm, his home in Greenwich. M. Jodi Rell set many Fridays aside as “reading days” at her antique farmhouse in Brookfield. Malloy sold his Stamford home after his election. Ultimately, Weicker and Rell spent more time in Hartford than they originally anticipated. At least to begin, Lamont will try to schedule meetings on Fridays in Fairfield County. Flanagan Johnson said Lamont’s scheduler will consult with Annie Lamont’s office, seeing when their jobs can place them in the same locale. Lamont will aim for a Monday-Thursday schedule in Hartford, or at least no later than midday Friday, every other week. They will try to build a schedule on his Greenwich weekends that start the week with meetings down state or on the way to Hartford. Flanagan Johnson said he hopes to spend time downstate meeting with business leaders — and lawmakers. He has invited new legislators to the Executive Residence next week, but he already has begun his outreach. The national anthem at his inaugural ball was played by Sen. George Logan, a Republican. He is a guitarist who ably covers Jimi Hendrix solos, including the late rocker’s memorable electric version of the Star Spangled Banner. Logan, who supported Republican Bob Stefanowski for governor, laughed at the time, not quite taking him seriously. But Lamont called his cell phone after winning, leaving him a voice-mail inviting him to kick off the ball. “I thought it was a good gesture,” Logan said.